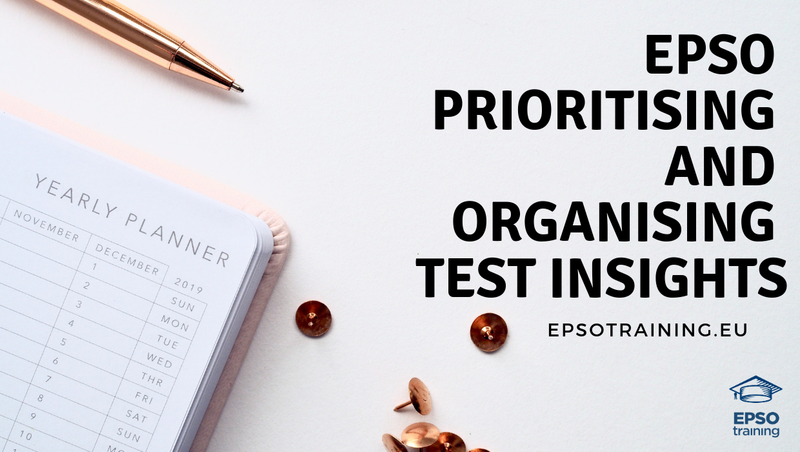 Another test aimed for all candidates who are taking part in the EPSO AST competitions is the EPSO Prioritising and Organising Test. As with the nature of the job, it helps for assistants to constantly be up on their toes with that certain clarity in mind to tackle the incoming tasks ahead. What is the EPSO Prioritising and Organising Test? Contending in a highly sought-after career at EPSO means having to undergo multiple selection processes that will weed out those who cannot handle the job as much as the rest. The EPSO Prioritising and Organising test is one of the pre-selection tests that have been applied since 2012 to assess AST candidates. What Skills Are Tested in the EPSO Prioritising and Organising Test? What Is the Composition of the EPSO Priotising and Organising Test? Compared to other tests organized by EPSO, the EPSO Prioritising and Organising test is relatively easier. However, this does not mean that less preparation is required. Since all EPSO competitions are difficult, it is a must that you must get one of the highest scores, typically 80% of overall. Therefore, you must still keep in mind how this test goes about in order to make the best out of it. Helping you with that, here is the typical composition of the EPSO Prioritising and Organising test. From the given information, 24 questions must be answered under 30 minutes, giving you an average of 75 seconds per question. Candidates may be asked questions that range from organizing the different modes of travel to get to a meeting on time and the likes. All of these things depend on the data contained in the table about a particular given situation. You will have five different answer options available from which you must select the correct one. Carefully assess the given information. Observe well and think thoroughly the hierarchy of the processes that is presented in the situation presented. Remember that these are situated in real life scenarios. So it helps that you get your practical thinking caps on. Given that you have to choose among five choices for the best and correct answer, you must then be able to conduct a methodical approach to the test. 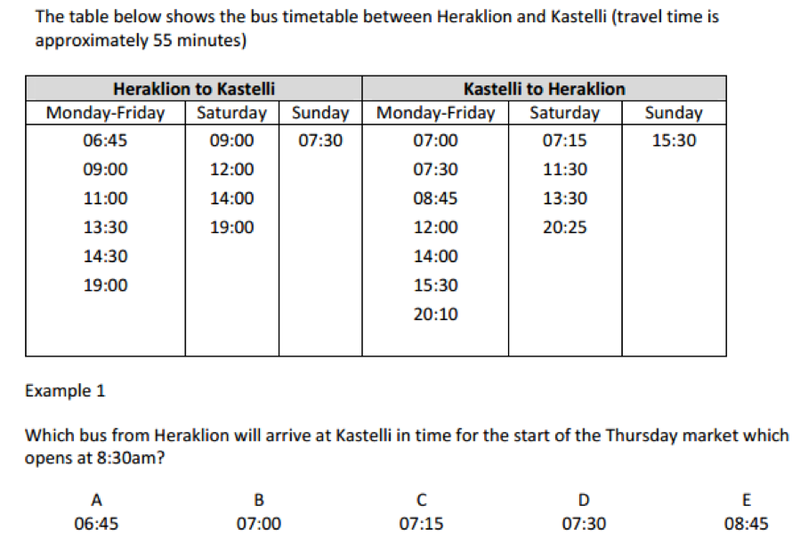 You will be presented with timetabling problems that will ask you to organise a schedule. Other times, you will also be dealing with constraint optimisation problems. To overcome the confusion, you must then be able to interpret a table correctly, form an equation, or a series of instructions. 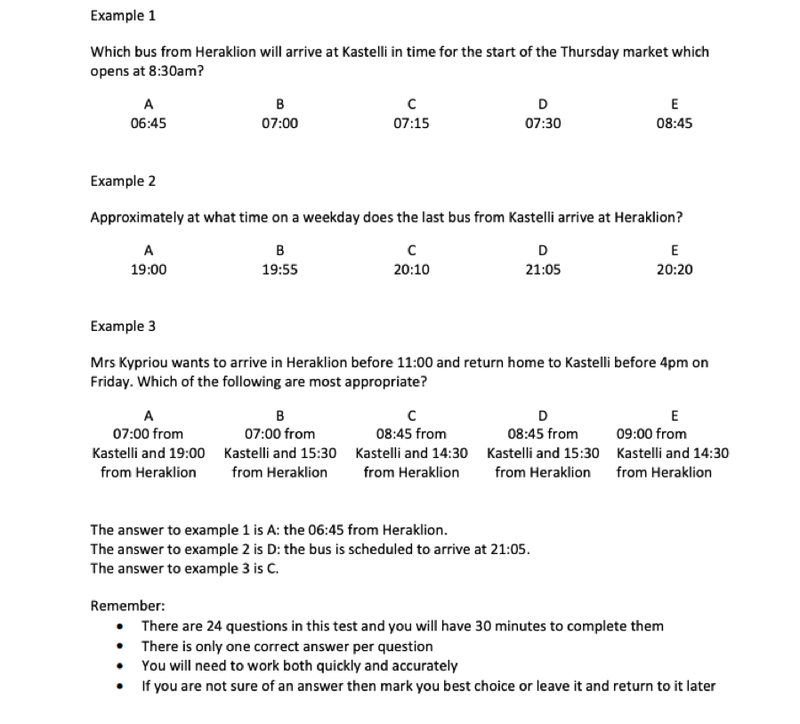 To give you a full experience of the upcoming EPSO Prioritising and Organising test, we have below some examples that you can practice on. In order to test your ability to organise and prioritise work, you will be given a set of information in the form of timetables, charts, and tables. From what you have gathered through the figures, you will have to respond to a number of questions accordingly. Question: You and your wife are in town for a visit and wish to check into a hotel. Your wife wants to stay in at least a 2 star hotel but your budget is only 100 euros. Which hotel should you check in if you and your wife want to sleep on separate beds? Answer Details: The answer is Cathay. From the given information, it is specified that the wife wants to check in at least a 2-star hotel that will be sufficient for your budget of 100 euros. This leaves you with either Carlton’s Double Room with one star and Cathay’s Twin Room with two. Further on, it is mentioned that the wife wants to sleep on separate beds. Thus, this points to Cathay—a two-star hotel with a twin room for the price of 100 euros. 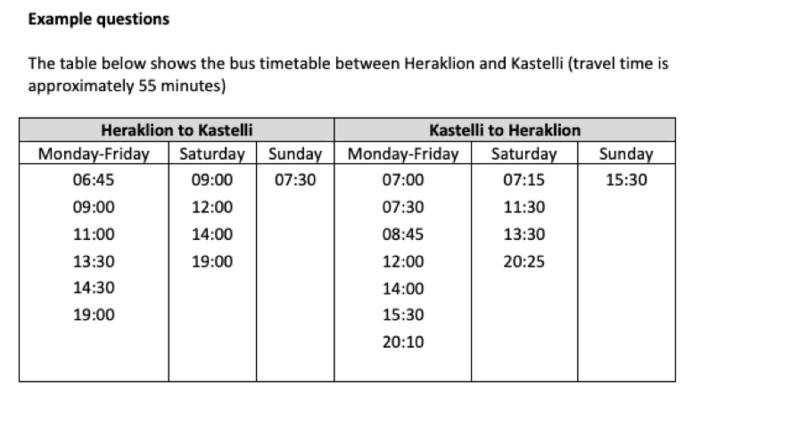 Question: If you want to go to Paris but you do not want to fly direct, which flight should you take if you want the cheapest flight that takes between 4 to 5 hours? Answer Details: From the given information, the correct answer is Flight I511. It is not a direct flight to Paris with Istanbul as a destination. Moreover, it is the cheapest with 400 euros and takes only 4.5 hours.